Figure from the 2019 Fall Economic Statement. Earlier this year, the Chamber of Commerce released yet another report on how public protections and other regulatory requirements are undermining Canadian competitiveness—and how the government should go about deregulating to make life easier for businesses big and small. Though it wasn’t directly tied to the Trump administration’s massive gutting of environmental and energy sector rules, the report clearly played into fears in Canada that Canadian industry will jump the border unless we level the playing field on rules affecting business. The Chamber of Commerce report, Death by 130,000 Cuts, was sponsored by CropLife Canada, the umbrella lobby group representing the domestic and multinational pesticide and GMO industry, along with a handful of energy, petroleum and pharmaceutical firms. 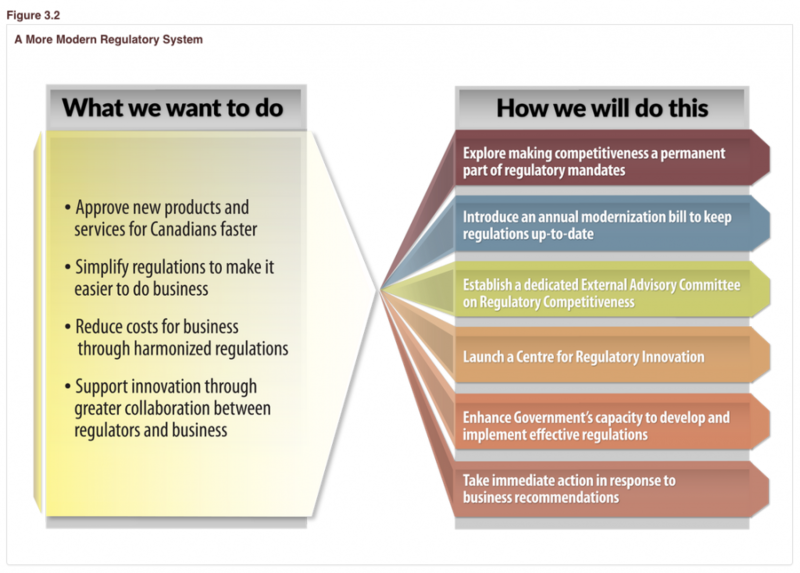 In it, the Chamber applauds the ways both Conservative and Liberal governments have transformed regulatory policy over the years to be more supportive of business and innovation, but then makes seven recommendations for how government could really get out of the way. Many of those recommendations made it into Finance Minister Bill Morneau’s Fall Economic Statement, which provided both substantial tax benefits for big business and a significant number of new deregulation initiatives. Some of the Trudeau government’s plans seem to be drawn directly from the Chamber’s wish list. Let’s compare the two documents. Chamber of Commerce: “Establish a government-business regulatory competitiveness working group.” This group, “co-chaired by a senior federal and senior business representative,” would “help restore business confidence in Canada’s investment climate.” The working group should develop ways to “reduce the cumulative burden and accelerate regulatory simplification,” by increasing the scope of the mind-numbingly stupid one-for-one rule and establishing a permanent “stakeholder-advisory body” to propose regulatory changes to agencies and departments who must “comply or explain” why they don’t want to make those changes. It’s important to recognize that Canada’s regulatory regime is already one of the most pro-industry in the developed world, in particular as it governs the activities of the fossil fuel and agricultural sectors. Canadian companies may have some legitimate complaints about duplicative forms or overly complicated administrative requirements. But these don’t justify putting the foxes in charge of the proverbial henhouse. You just need to look at the constitution of the Canadian Food Inspection Agency’s “value chain roundtables” (in play since 2003) to see how food and agricultural policy has been mostly captured by industry in this country. Canada has also enshrined light-touch regulation in a number of cabinet directives going back to the Chrétien and Martin Liberal governments, the most recent of which went into effect in October. This way of regulating, in close co-operation with industry stakeholders and with a view to minimizing trade barriers, is also now locked into international treaties like the Comprehensive and Progressive Agreement for Trans-Pacific Partnership and recently concluded U.S. Mexico Canada Agreement (USMCA or “New NAFTA”). Sharon Treat (IATP) and I recently gave a webinar on how the “good regulatory practices” provisions in these agreements will get in the way of our ability to adequately, and in a precautionary way, protect humans, animals and the environment from harmful industrial activities. This pro-industry style of regulating was embraced by past Conservative and Liberal governments to attract investment to the tar sands and to biosciences, among other sectors where precaution should be the norm but isn’t. Given new science on the need to drastically lower greenhouse gas emissions, and evidence that novel (i.e., genetically modified) crops and associated crop-protection chemicals are messing around with our bodies and ecosystems, it seems more than a little reckless to say Canada’s bigger problem is how to get products onto the market even faster (see graphic above). Minister Morneau may not have wanted to go into next year’s elections defending a Trump-style corporate tax cut that could hardly be sold as a benefit to the middle class (see David Macdonald’s recent three-chart explanation of why that’s the case). One of the most ambitious deregulation plans in a decade, however, may just fly under the radar, at least here in Canada. In Europe, by contrast, civil society groups are closely watching the agenda of the first meeting of the Canada-EU Regulatory Cooperation Forum set for December 14 in Brussels. Environmental and consumer safety advocates, who are pointing out that “good regulatory practices” are the antithesis of the precautionary principle, have been assured by the European Commission that the bilateral CETA regulatory committee will not put pressure on Europe to recognize sometimes weaker Canadian public protections as equivalent to European standards or otherwise get in the way of one side adopting stronger protections than the other. Morneau’s Fall Economic Statement suggests quite strongly that the federal government, acting on behalf of multinational business stakeholders, would expect nothing less from the process. Stuart Trew is Senior Editor of the Monitor, the CCPA’s bimonthly magazine, and a part-time researcher with the centre’s Trade and Investment Research Project. Stuart was a co-presenter in a recent webinar on regulatory co-operation and the “good regulatory practices” chapter of the new NAFTA (USMCA), which you can view here.